Our Site is set on the earthworks of an historic Iron Age Encampment, the earthworks that were built 100’s of years ago are amazing and cannot be recreated. over 120 acres of trenches and ravines all over the site, large raised tree ridges and banks, our site is not just sat on the side of a woodland hill! each game is like walking into a different world, the terrain changes all over the site. Each of our game zones is located in a differnt area, allot of laser tag sites will make you play variations of games in the same arena! WE DO NOT! We want to you to have an amzing experience. We are always updating and changing our games,so that your next experience will be even better! We have more games than you could possibly play in one day, you can then come back another time and play different arenas. listed below are the most played games. We take great pride, each of our arenas has taken hours of work and maintance to make your games varied everytime you play at Exeter Laser Tag. FLAG TO FLAG – 2 Bases, 2 flags – Aim of the game to get from your base to the other teams base, take their flag and get it back to your base to win the game! – Team work needed to win! AMMO DUMP – 1 base situated in the middle of the arena, Located inside is a large ammo box, one team has to defend the ammo box while the other attacks to retrieve. Close combat, fast action – Smoke grenades advised!! THE VILLAGE – Attack & Defend – One team is defending the Village. The other starts far away and has to attack, take control of the lookout tower and lower the flag to win the game. Lots of Huts, barriers, large trenches – Smoke grenades advised!! DOUBLE BRIDGES – 2 Bridges, 2 flags – Aim of the game to cross either bridge, retrieve the other teams flag and cross the bridge to win! Close, fast & extreme combat! – Smoke grenades advised!! ZULU WARRIOR – Dense arena, completely different terrain to any of the other games zones. Zulu huts located deep in the dense forest. Attacking team do not know where the Zulu warriors are located! PLANE ATTACK – Large open arena – A plane has crashed carrying an important cargo, you have to retrieve before the other team. 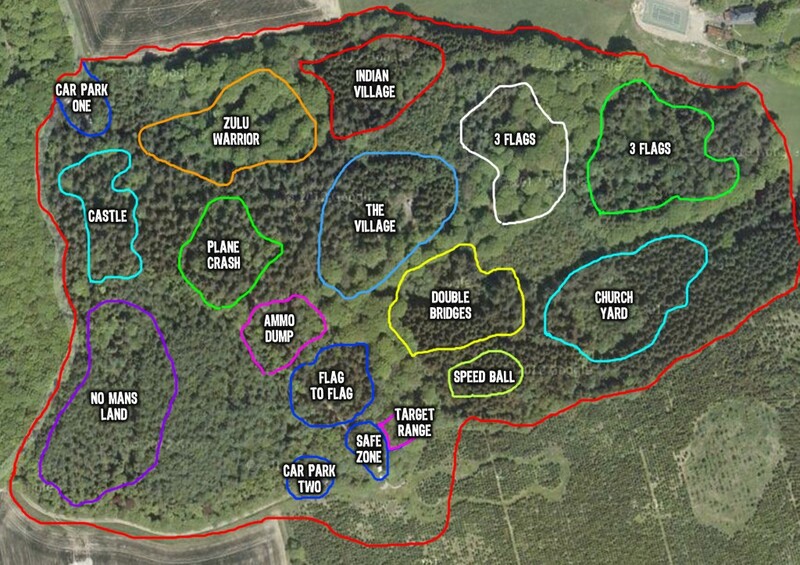 NO MANS LAND – Massive arena – Wide open terrain, Large ravines, 3 Bases each with a flag pole, aim of the game to get your teams flag raised in each base! SPEED BALL – Small arena with lots of obstacles, Team start at either end of the arena, Teams have to retrieve 2 barrels from the middle and get back to base to win! 1 FLAG – Large arena, 1 flag located in the middle. 1 base camps. Aim of the game to get from your base to the flag and then get the flag into the other teams base to win the game. GRAVE YARD – Attack & Defend – One team has hold of the church, while the other has to navigate the haunted grave yard and take control of the church!